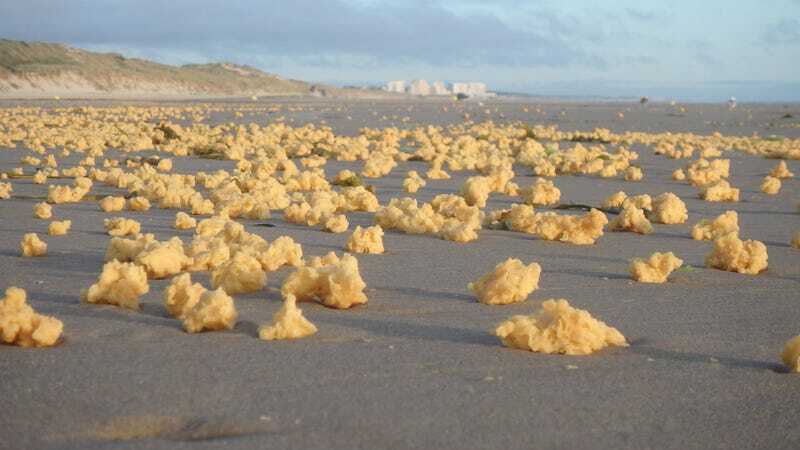 Yesterday, a team of firefighters from d’Étaples went to the beach of Equihen-Plage to observe and collect samples, reports La Voix du Nord. Samples were sent to the Cedre Association in Brest, which specializes in analyzing hydrocarbon pollution. The Cedre Association was founded following the sinking of the Amoco Cadiz, and the group’s mandate is to protect local waters from pollution. Results are expected in about a week. Foam (if that’s what this is) is a natural product of the ocean, but in addition to needing air and water to form, it also needs a “surfactant”—a binding molecule that clings to the surface between water and air. Surfactants can come from many human-caused sources, including fertilizers, detergents, and sewage. Some kind of chemical with this binding property may be churning in the waters near the Pas-de-Calais, but we’re going to have to wait a few days to find out exactly what it is.